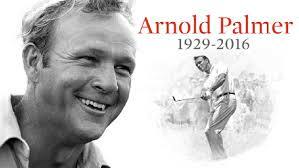 In my lifetime, Arnold Palmer was golf. I remember on rainy Sunday afternoons my Dad and I watching Arnold hitch up those baggy pants and take such a tremendous lash at the ball that his follow through would twirl around his head. Arnie wasn’t the longest hitter on tour but nobody hit the ball any harder. I used to imagine that the golf ball screamed in pain, like the baseballs in the Looney Tunes. A wristy putter, with his scrunched over, knock-knee stance Palmer was deadly on the greens. It wasn’t until he changed to the “normal” putting stroke, with no wrist break, that he lost his touch on the greens, never to return to him. I have no clear proof, but Arnie was the first pro with a clothing line. Musingwear produced the golf shirt styled after Palmer’s polo style shirt. On Arnie, the shirt highlighted his trim and muscular physique. On his “Army”, that shirt highlighted a different part of the anatomy, having little to do with trim. Later, Arnie has a canned ice tea named after him. At home, Palmer would drink a mixture of three parts unsweetened ice tea to one part lemonade. The canned tea, distributed by the Arizona Beverage Company is made half and half and is named as such. At The Seminole Golf Club in Florida they spoil you and serve Arnie’s original recipe mixed on the spot. I never enjoyed the can version since. Today’s pros fly private planes from tournament to tournament. Arnie was the first professional golfer that I know who flew his own private planes and later jets. When I say flew, I don’t mean enjoyed the ride. Palmer actually was the pilot who flew the aircraft. It was Palmer who renewed the American interest in the British Open. Like I said earlier, my Dad and I watched the grainy B&W images beamed back on ABC’s “Wide World of Sports.” Not since Bobby Jones had the golfers of the British Isles embraced an American competitor. I’m sure it was the rugged image of Palmer dragging on his cigarette, throwing it to the ground and taking that mighty thrash. It was the British Open where “Arnie’s Army” began it’s recruitment. Counting its TV members, that army was in the millions. My only other contact with Palmer was by Six Degrees of Separation. I met his dentist in Orlando. 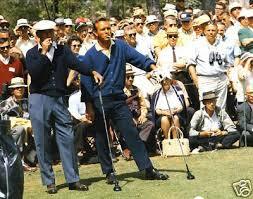 He was very proud of his friendship with Arnold Palmer. I think he wrote a book about it. And why wouldn’t he? They say that the modern pro owes much to Tiger Woods for his popularity raising interest in golf worldwide and for the amazing purses they now play for. 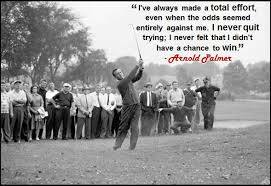 Professional golf would still be a minor sport watched by dilettantes and played for little money, if not for Palmer. Arnold Palmer was a man every man admired and every golfer of his era wanted to be. The King is dead. There is no heir and there will never be one.